This painted wood Nativity was made by a group of artisans in Kyrgyzstan. 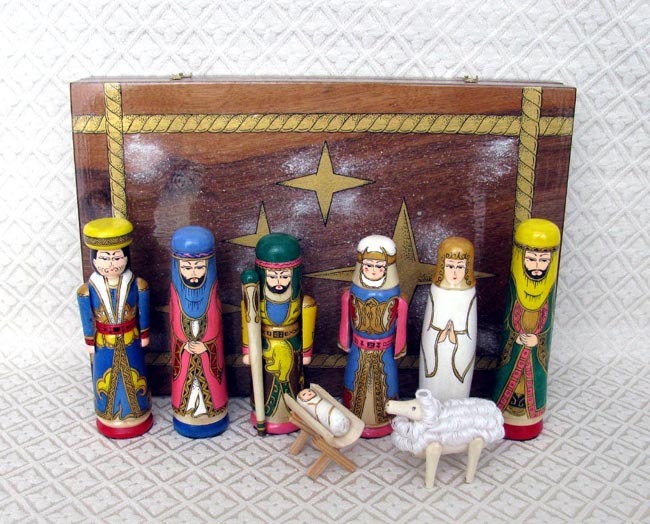 The set includes Joseph, Mary, baby Jesus in a manger, an angel, a fluffy sheep, and three wise men. The set comes in a decorated wood box that measures 12 inches wide by 8 inches tall. The Joseph figure measures 4.75 inches tall. A woman named Ira started this project in 2000 after some foreign women commissioned her to create an ethnic wooden chess set. Within the artisan group, Sasha makes the boxes, Fia paints the boxes, Aibek turns/forms the wood figures, Faiya and Sveta paint the figures, and Rashid (Ira’s husband) lacquers all of the pieces. Ira manages the group.